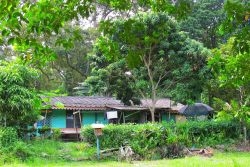 Pulau Ubin is a charming island 10 minutes off East Coast and one of Singapore’s last remaining rural areas where you can still witness the old kampong (Malay for "village") lifestyle. Originally a granite quarry, Pulau Ubin is known today for its abundant and varied forest and marine life, and is home to projects for hornbill conservation and seahorse monitoring. If you use public transportations, alight at Tanah Merah MRT station, then take the Bus 2 to Changi Bus Interchange. 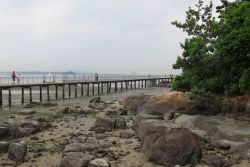 A 3-minute walk will take you to the Changi Point Ferry Terminal from where you can catch a rustic bumboat. For just 2.50 dollars, you’ll be ferried across to Pulau Ubin while enjoying the views of the coastal area and the occasional sailing boats from nearby Changi Sailing Club. Once you step off the boat, you will be greeted by friendly vendors from the bike rental shops lining the arrival area. Bikes can be brought to the island by boat for a small fee, or rented at quite moderate rates. Bikes with child seats are also available. When you arrive on Pulau Ubin, be sure to ask what time the day’s last boat departs for the trip back Singapore. You’ll want to be back to the boat dock well before the last scheduled trip. The reason is that if you happen to be the last party of the day, and there aren’t enough people in your party to fill a boat, you may be asked to pay a special "private trip" rate, for passage in a boat that isn’t full. 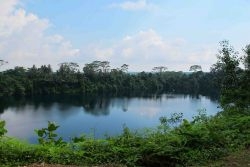 Pulau Ubin offers several bicycle trails, some of which are suitable for families with children. Head right and follow the signs for Chek Jawa, a 100-hectare wetland area on the island’s south-eastern tip that recently became a focus of attention because of its enormous biodiversity. At low tide, the National Parks Board offers free guided tours, highlighting and explaining how unique it is to find such a variety of distinct ecosystems in one small area: sandy beach, rocky beach, sea-grass lagoon, coral rubble, mangrove forest and coastal forest. There is also a 20-metre tall viewing tower, a 1.1 km boardwalk and a visitor centre with a viewing jetty. 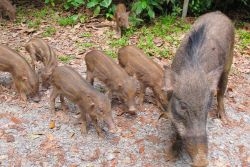 If you are lucky, you might encounter an entire family of wild boars. They are always hungry and curious, so keep any food in your bags and avoid approaching them, especially if they have piglets. Ketam Mountain Bike Park is one of Singapore’s best mountain bike trails, stretching through more than 8 km of thick jungle, with steep climbs and breathtaking descents. Experienced mountain bikers rate it "a blast!" The nearby quarry offers beautiful views of the island. We recommend exploring Pulau Ubin on weekdays, to avoid the weekend crowds, and for the best opportunity to enjoy the areas’ rich tropical beauty. Also, be sure to bring along mosquito repellent, sunscreen, water, coins for the drink vending machines along some of the bike trails and snacks if you plan to spend the day. There are however several simple seafood restaurants near the boat dock. 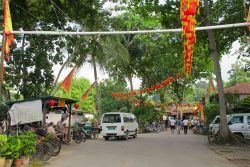 Back on the main island, there are several local eateries near the ferry terminal along Changi Village Road as well as a popular Hawker Center with nice views of the park and a playground.